Welcome to the website of The Amsterdam Stun, the longest running monthly magazine for Amsterdam's English speaking community. To view the latest edition, click on the picture to the left. Earlier editions can be accessed through the Archive pages or by typing something in the search-box, above right. 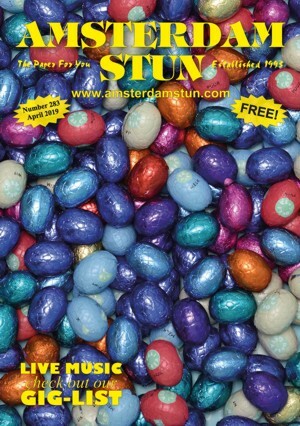 If you would like to pick up a copy of the Amsterdam Stun, just drop into any of the places listed on our Bars page. Visit our Photos page to see all of our latest shots, including unpublished ones, and you can expect to see new photos BEFORE they appear in the next Stun. Order colour prints of photos from the Amsterdam Stun from the comfort of wherever you are! T-shirts too, plus World-Wide Shipping! Check the Stun Gig-List to find out who's playing in our favourite venues around Amsterdam. The football season has started and we have over 40 contestants for this season’s Premier Predictions League, sponsored by Coco’s Outback. We’ll be posting regular updates, but that’s just for fun; it’s how you finish that counts! We also have a Facebook group, where you can leave your comments and interact with other Stun readers.